Please click here to view our catalogue for this product in PDF format. The Saf range of pyramid style ring rolling machines where all three 40 mm shafts are gear driven and manufactured from hardened and grounded strength steel. 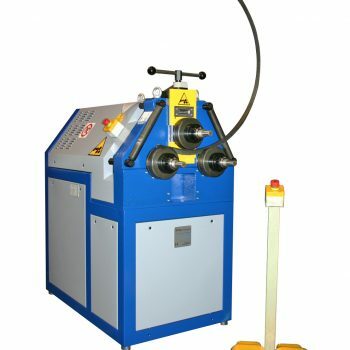 These machines are very flexible and are suitable for bending a variety of sections including tube, angles, flats, I beams and special profiles. It consisits of a manual control for the top roll, with a mechanical readout of the top roll position. Comes with a set of standard rolls. Can be positioned in both vertical and horizontal positions. Digital display for the top roll position.